IMPORTANT NOTE regarding cancellation and no-show: No refunds or credits will be allowed without three business days' notice from the date of the event (as that is the deadline set by our venue). This is intended for our outreach program. Please contact us for approval and the discount code. Pulitzer Prize finalist Annie Jacobsen has shown us time and again with her bestselling books that the truth is often stranger than fiction. 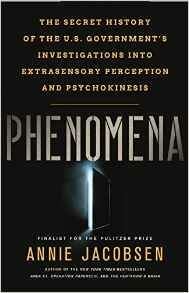 In her powerful new book, Phenomena: The Secret History of the U.S. Government’s Investigations into Extrasensory Perception and Psychokinesis, Jacobsen traces the U.S. government’s long-hidden history—beginning during the Cold War—of military and intelligence agency experiments on extraordinary human functioning, including mental telepathy, clairvoyance, precognition, and other forms of extrasensory perception (ESP), for defense purposes. The scientific community rejected such investigations as pseudoscience, but the government raced to advance technology and influence human behavior after World War II by experimenting with these seemingly supernatural phenomena in a series of highly classified programs. With Jacobsen’s rich storytelling, key figures come to life, such as research scientist Andrija Puharich, who first postulated nerve conduction and an unknown energy force within humans; the Apollo astronaut Edgar Mitchell, who conducted ESP experiments while journeying to the moon; and Uri Geller, a former Israeli Army paratrooper who became one of the most famous psychics in the world—mystifying thousands with his seemingly inexplicable telepathic and psychokinetic abilities demonstrated by bending spoons and making watches stop. Jacobsen also probes the ongoing battle between skeptics and believers in the CIA over all things supernatural. ANNIE JACOBSEN is the author of The New York Times bestsellers Area 51 and Operation Paperclip and the Pulitzer Prize finalist The Pentagon's Brain. She was a contributing editor at the Los Angeles Times Magazine. A graduate of Princeton University, she lives in Los Angeles with her husband and two sons. DEADLINE FOR REGISTRATION: Friday, March 31, 2017. The Prologue Society, Inc. is a tax-exempt organization under IRS code 501(c)(3). Contributions to The Prologue Society are tax deductible as permitted by law. We do not sell, share or disclose any information to any third parties. Copyright 1992-2019 The Prologue Society, Inc.